Generosity. Are we generous with our possessions and our time? Boaz didn’t have to give Ruth anything, and yet, before she heads home for the morning, he gives her a gift. Read Ruth 3:14-15. 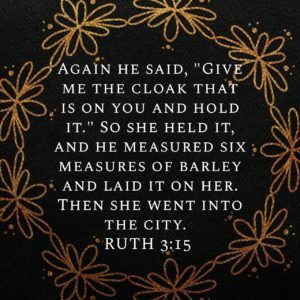 Again he said, “Give me the cloak that is on you and hold it.” So she held it, and he measured six measures of barley and laid it on her. Then she went into the city. Ruth came that night just expecting to be able to ask Boaz about being her kinsmen redeemer. Yet, he would not allow her to leave without having something right then to show for her visit. He was very generous with the possessions that he had because all of that was his grain. Are we generous with what we have? Do we seek for ways to show our generosity to other people around us who may need things more than we do? Do we find ways to go above and beyond for the people who come to ask us things in the first place? Boaz was always looking for ways to treat people generously. Will our life be the same?